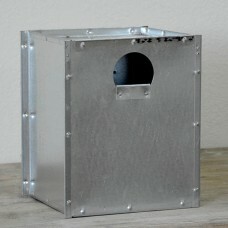 (A507) Small Parrot box- Designed and manufactured at the feather farm with 25 years breeding experience. Our avian Breeding nest boxes are made of 24 gauge galvanized sheet metal which is safer, cleaner and longer lasting than a wooden nest box. This box comes fully assembled, includes an inspection door for viewing and pulling babies. Entry door is 3" in diameter. great for lovebirds, cockatiels and small conures.